It is a long way from Nar Nar Goon to a Royal Command performance but Alan Cole made that journey as well as many many more in the course of a 15 year career as a VFL field and goal umpire. The performance in front of HM Queen Elizabeth II was a novelty in a number of ways not only for the royalty aspect but also for being played on a Sunday. There is no wonder it was his most memorable day in football: meeting Her Majesty on the ground at half-time just after she had unfurled the 1969 premiership flag, an all-in brawl in the second quarter (missed by the royals) and a Fitzroy upset over the reigning premiers to open the season. All five umpires on the day had earned their spot as reigning grand final umpires having officiated the previous September in Richmond’s win over Carlton for the 1969 premiership. That is one of the more remarkable two-consecutive match combinations in VFL history – memorable indeed. That Sunday was Alan’s 49th senior VFL match after his debut in round 2, 1967 and he would go on to complete 171 matches by the time he retired at the end of the 1976 season. Among these matches were four other finals: the 1968 and 1971 Preliminaries, the former in front of a record 103, 649, and the 1972 and 1973 Second Semis. The 1972 final was the first ever second semi-final played under the new final five format, the first ever final played at VFL Park and was an absolute cracker finishing in a draw. When Marty McMillan squeezed home a very, very tight goal in time-on at Alan’s end the Tigers had a six-point lead but they couldn’t quite hang on in the dying minutes as Armstrong for the Blues levelled the scores forcing the replay. Charles Alan Cole was born in Bunyip, Victoria on 10 October 1926 and grew up in Nar Nar Goon, Ballarat, Sheep Hills and St.James before moving to South Melbourne. He played football for Lake Rowan FC and Albert Park and was also successful in school junior and intermediate athletics. He began umpiring in 1952 as a field umpire with the VFL Second Eighteens and was with them until his promotion the VFL senior list for the 1956 season. During that first year he returned to one of his old home towns, St. James but they were beaten by visitors Mulwala. Alan umpired three VCFL reserves finals, all in 1957, and for the remainder of the time toured the country centres through the home and away season. At the end of 1960 he had accumulated 71 VCFL and 5 Metropolitan league matches. Upon retirement from the field he returned to newly named VFL Reserve Grade and took up the flags. Again he was successful and following a six-year apprenticeship he and three others, Reg Pawley, Peter Stokes and Alf White, were promoted to the VFL list for 1967. They all debuted in round one Alan being allocated Heritage Number 149 when appointed to South Melbourne versus Fitzroy at the Lake Oval. As well as success on the field ‘Nat’ also contributed to the umpires’ association following his election to the Executive Committee in 1968-70. He became a life member in 1971. At the end of 1976 Alan had reached the VFL’s mandated retirement age of 50 years. In the ensuing seasons he continued to give back to umpiring assisting Norm Price by observing VFL Reserve Grade goal umpires in matches and training with at Albert Park. He also began a successful bowls involvement winning various club pairs and triples championships. One of a number of umpires from his generation to move to Yarrawonga in his retirement years Alan still managed to return regularly to the AFL Grand Final Umpires’ Club functions and various other umpiring events as the years rolled by. 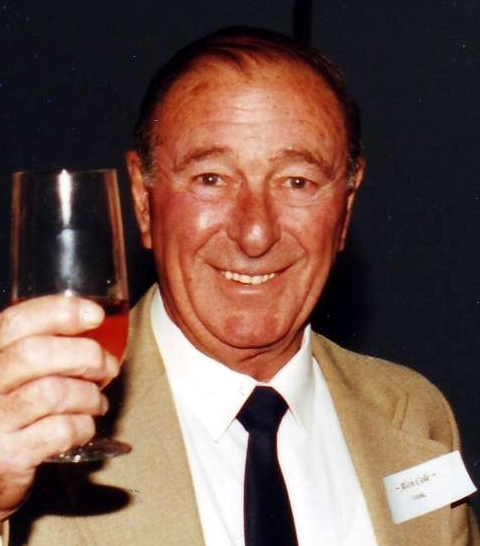 Alan Cole passed away in Yarrawonga on 23 November 2016 and umpire to the end as his death notice concluded ‘The Man In White Is Always Right’.